The Alta California or Daily Alta California (often miswritten Alta Californian or Daily Alta Californian) was a 19th-century San Francisco newspaper. The Daily Alta California descended from the first newspaper published in the city, Samuel Brannan's California Star, which debuted on January 9, 1847. Brannan, who had earlier assisted in publishing several Mormon newspapers in New York, had brought a small press with him when he immigrated to California as part of a group of Mormon settlers in 1846 aboard The Brooklyn. With Dr. E. B. Jones as editor, the California Star was the city's only newspaper until an older publication, The Californian, moved to Yerba Buena (as San Francisco was then called) from Monterey in mid-1847. The city was about to undergo rapid changes as the California gold rush got underway. The California Star appeared weekly until June 14, 1848, when it was forced to shut down because its entire staff had departed for the gold fields. Its rival newspaper had suspended publication for the same reason on May 29. Later that year, Sam Brannan sold his interest in the moribund California Star to Edward Cleveland Kemble, who also acquired The Californian. Kemble resumed publication of the combined papers under the name Star and Californian on November 18, 1848. On December 23, 1848, the California Star and Californian ran an article indicating this would be the last issue. In a business arrangement with the firm of Gilbert, Kemble and Hubbard, a new paper, entitled ALTA CALIFORNIA, would be published at San Francisco, Upper California, the first issue of which would appear on Thursday, January 4, 1849. By 1849, the paper had come under the control of Robert B. Semple, who changed its name to the Alta California. On January 22, the paper began daily publication, becoming the first daily newspaper in California. On July 4, 1849, Semple began printing the Daily Alta California on a new steam press, the first such press in the west. In 1863, Albert S. Evans became editor at the paper and continued in that capacity for several years. The newspaper continued publication until June 2, 1891. The Daily Alta California was also published as weekly, tri-weekly, and steamer editions. The Weekly Alta California was published every Saturday and the Steamer Alta California was published on the departure of the Steamers of the 1st and 15th of the month. ^ "San Francisco Genealogy-The Brooklyn". Retrieved November 9, 2017. ^ "California Star December 23, 1848". Retrieved November 26, 2012. ^ a b "About this Newspaper: Daily Alta California. - Chronicling America - The Library of Congress". Retrieved November 6, 2009. ^ "Albert S. Evans". Fort Whipple, Arizona: Arizona Miner. 4 May 1867. p. 2. Retrieved 18 April 2015 – via Newspapers.com. ^ "Alta California". Retrieved November 9, 2017. ^ "Steamer Alta California September 1, 1850". Retrieved November 9, 2017. Wikimedia Commons has media related to Daily Alta California. Samuel Brannan was an American settler, businessman, journalist, and prominent Mormon who founded the California Star, the first newspaper in San Francisco, California. He is considered the first to publicize the California Gold Rush and was its first millionaire. He used the profits from his stores to buy large tracts of real estate. He helped form the first vigilance committee in San Francisco and was disfellowshiped from the LDS church because of his actions within the vigilance committee. Brannan's wife divorced him and he was forced to liquidate much of his real estate to pay her one-half of their assets. He died poor and in relative obscurity. 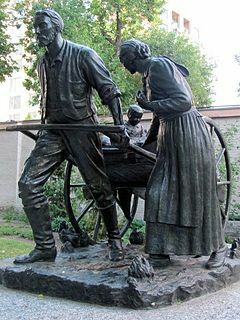 The Mormon pioneers were members of The Church of Jesus Christ of Latter-day Saints, also known as Latter-day Saints, who migrated across the United States from the Midwest to the Salt Lake Valley in what is today the U.S. state of Utah. At the time of the ceasefire and planning of the exodus in 1846, the territory was owned by the Republic of Mexico, which soon after went to war with the United States over the annexation of Texas. Salt Lake Valley became American territory as a result of this war. The media in the San Francisco Bay Area has historically focused on San Francisco but also includes two other major media centers, Oakland and San Jose. The Federal Communications Commission, Nielsen Media Research, and other similar media organizations treat the San Francisco-Oakland-San Jose Bay Area as one entire media market. The region hosts to one of the oldest radio stations in the United States still in existence, KCBS (AM) (740 kHz), founded by engineer Charles Herrold in 1909. As the home of Silicon Valley, the Bay Area is also a technologically advanced and innovative region, with many companies involved with Internet media or influential websites. Yerba Buena was the original name of the settlement that later became San Francisco, California. Located near the northeastern end of the San Francisco Peninsula, between the Presidio of San Francisco and the Mission San Francisco de Asís, it was originally intended as a trading post for ships visiting San Francisco Bay. The settlement was arranged in the Spanish style around a plaza that remains as the present day Portsmouth Square. As of year-end 2017, The Church of Jesus Christ of Latter-day Saints reported 767,301 members in 1,278 wards and branches, 16 missions, seven temples and 228 Family History Centers in California. The Californian was the first California newspaper. The California Campaign (1846–1847), colloquially the Conquest of California or Conquest of Alta California by the United States, was an early military campaign of the Mexican–American War that took place in the western part of Mexico's Alta California Department, in the present-day state of California. The California Campaign was marked by a series of small battles throughout 1846 and early 1847. The timeline of North American telegraphy is a chronology of notable events in the history of electric telegraphy in the United States and Canada, including the rapid spread of telegraphic communications starting from 1844 and completion of the first transcontinental telegraph line in 1861.